The Oral History Research Center (OHRC) at the UNLV University Libraries records eye-witness accounts from members of the Las Vegas community to document the history of Las Vegas and Southern Nevada. These oral histories present in a very immediate and engaging way a piece of history through the actual voices of those who were there. The OHRC conducts, collects and makes available audio and video interviews. Narrators are selected for their ability to provide reliable first-hand accounts of the history of Las Vegas and Southern Nevada. Each year the OHRC defines one or more new projects that center around a particular historical subject or them. These projects result in a series of interrelated histories. The Boyer Early Las Vegas History Project is ongoing. The OHRC is located in the UNLV Libraries Special Collections. Interviews conducted by the OHRC as well as interviews recorded by several earlier projects may be found and used in Special Collections. Interviews are also increasingly available online. 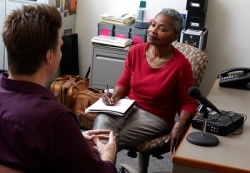 Check the Special Collections blog for updates on the activities of the Oral History Research Center.